which means as a person, the more I take a substance, the more risk I take for my health. There is even an indicator called LD50 (see Median Lethal Dose), which specifies the 'lethal dose' at which 50 percent of subjects will die. Yes. Taking antibiotics (and by extension antivirals and antineoplastics) at low doses is dangerous, as this creates an evolutionary pressure to evolve antibiotic resistance (or rather, incorporate through horizontal gene transfer). This is dangerous because an infection resulting from these bacteria will then be harder to treat. In the paper "Experimental evolution of resistance to an antimicrobial peptide", Perron et al. gave E. coli the chance to evolve resistance against a novel antibiotic. When given a high dose initially, most bacteria died. When exposed to low doses, the bacteria evolved resistance in 600 to 700 generations. For the same reason it is strongly advised to finish a course of antibiotics even after symptoms fade. This is a bit of a news flash - the answer is probably yes. Reading through recent Nature articles this one popped up: Toxicology the learning curve. Where there are some intriguing examples of low concentration only toxic effects. It might be worth a read. The preface gives a review of the idea, going back to the 16th century physician Paracelcius that the toxic properties of anything increases monotonically with dosage. This is reflected in most of the answers and its one of the few things which toxicologists universally expect to see. A research group at U Missouri-Columbia is claiming that endocrine disruptors have non-monotonic toxicology curves, meaning that toxic effects actually decrease with greater dosage. Nature is kind enough to allow access to this image. The three curves on the right show a decline in drug effect as concentration increases. Endocrine hormones act at very low dosage - testosterone, estrogen, pituitary and thyroid hormones are some examples. We'll probably be hearing more about this in the future, rather than less. While this is still controversial, its made news because it is the sole class of compounds which really behave this way. notably the first curve is for BPA (Bisphenol A) - the plastcizer which is common in pool toys and toy inflatable balls and drink bottles but the FDA has flagged for closer study. No. The influence of dose–response relationship on toxicity is one of the fundamental properties of (bio)chemistry, and follows directly from the fact that concentration influences the reaction rate: a chemical reaction between two or more agents is a stochastic process where agents have a certain chance of interacting based on physical proximity (and other factors). The higher the dose, the higher the chance of two agents meeting, and a reaction taking place. 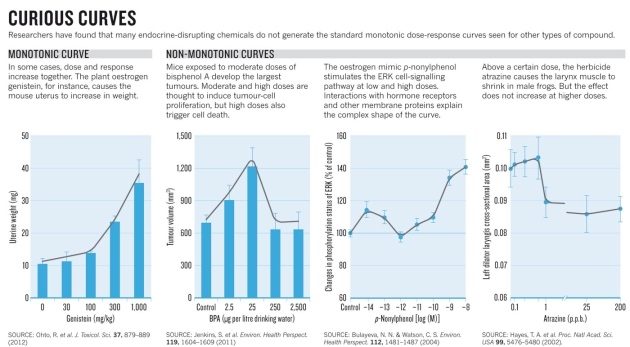 Although not all substances show a clear dose–response curve (simply because they are always reactive no matter their dose), toxicological studies which fail to show a dose–response relationship are met with scepticism. A recent example of this is the GMO toxicity study undertaken by the French scientist Séralini. One of the many flaws in this paper cited by other scientists was precisely this lack of dose–response relationship. Q: Can substances do more harm in a mammal at a lower dose than at higher dose? Some may know the example of the blood thinner, and widespread NSAID Acetyl-salicylic acid (Aspirin). I will use this example because Aspirin is one of the most known and used drugs in the world, with a long and interesting history. As being part of the class of nonsteroidal anti-inflammatory drugs (NSAIDs) it has recently gotten a bad wrap for blocking an enzyme which is crucial for prostaglandin synthesis and processes that maintain a healthy stomach wall in the presence of an potentially harmful bacterial and chemical milieu. On a sidenote, as an acid, Aspirin actually hardly dissolves directly in the acidic stomach. Aspirin can interfere with a lot of drugs, including Ibuprofen. The known list of drugs is so high, in part due to the widespread application of aspirin, and in part due to the chemical composition of this very small drug with two functional groups. A functional group is a sort of chemical feature that determines how and with what probability a chemical interacts in a given milieu. As a certain metabolic degradation pathway may get saturated, other pathways can take over and lead to different potentially harmful metabolites resulting in damage to the excretion/clearance organs such as the liver (hepatotoxic) and kidney (nephrotoxic). A metabolite is the product of metabolism ( a weak back-referencing definition). metabolic pathways are a sequence of chemical reactions within a cell, and metabolism is the entire set of metabolites and pathways. Liver/Kidney Toxicity is believed to result from an interplay of a) high concentrations of metabolites or direct toxins (=parent chemicals) within specialized high-concentration-forming cells, and b) the non/covalent binding of cellular macromolecules to interfere with their normal function and/or production of reactive oxygen species (ROS). Another example (from memory) is the interaction pharmacokinetics of theobromine (from cacao) and other xanthines (unverified). In fact drugs may act differently at different concentration thresholds at different times at different places within an organism and its cells that make it up. Evolution exploited this very early on and used it for things like body segmentation along defined axis during development. Drugs may interact with each other differently at different levels of concentrations, say as binary, ternary, and higher order complexes. The rate of formation of such complexes is denoted through the dissociation constant - which is a type of equilibrium constant such as pH is. The dissociation constant describes the propensity of a chemical species to separate reversibly and, - this is crucial! - is concentration dependent. This is accounted for by the use of so called activities or the apparent concentrations, as a result of incomplete hydration of the chemical and other effects of a "crowded environment". Now don't just think of chemicals, but macromolecules as well. In immunology for instance new molecular features can arise on the surface of a macromolecule, due to the association (complexation) with a small molecular drug. This in turn can lead to an immunological reaction, even anaphylaxis ( a so called Type I hypersensitivity reaction) and ultimately shock. Such drugs are classified as haptens. Important in an organisms sensitivity and susceptibility to drugs however, is the current allometric growth rate and types of organs and cells available. As such a fetus is more susceptible than an adult. I hope a simple yes accompanied by this admittedly to-long to really read post gave you some insight into what scientist across many, many fields are dealing with. Naturally, the issue is more complex. Not the answer you're looking for? Browse other questions tagged human-biology toxicology or ask your own question. Can ingesting substances that are produced by the body cause a permanent withering of the organs that produce the substance? Are high sounds worse for your hearing than low sounds? What makes white phosphorus toxic?